Truffles, olives, lavender, honey, nougat, rose-coloured wines, blue shutters, bluer skies and endless sunshine. It has to be the south of France (Property in the south of France). Provence? Well, sort of. Just above the area that most people think of when they think of Provence, lies an area known as the Drôme Provençale or Drome Provencale. Its boundaries are not clearly defined by any map, yet it has its own distinct character and ambiance, and for many, embodies the true nature of the Provence of their dreams. Where, exactly, is the Drôme Provençale? There's no such thing as "exactly", but you know you are in the Drôme Provençale when you reach the northern Vaucluse and the harsh Mediterranean rocky landscapes soften and become greener, or, if you are travelling southwards, when the skies above you become bluer, the sun shines brighter and the scent of lavender fills the air. The Drôme Provençale is the part of the Drôme department (Drôme Property Guide) that lies to its south, and also takes in the northern part of the Vaucluse department (Vaucluse Property Guide) in Provence. Thus it spans not just two departments but also two regions, as the Vaucluse lies in Provence-Alpes-Côte d'Azur (Provence-Alpes-Côte d'Azur Property Guide), and the Drôme department in the Rhône-Alpes (Rhône-Alpes Property Guide). What characterises the Drôme Provençale? The landscapes are softer than the mountainous regions to the north and east, and warmer too. The vegetation is partly Mediterranean, as in true Provence, but greener, lusher and generally less rocky. The region is steeped in history, and there is an abundance of castles, ancient buildings, pretty old villages and legends to prove it. The climate is perfect, with long hot summers and cold and short (though sometimes sharp) winters. 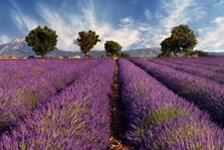 The region also benefits from a little more rainfall in spring and autumn than the southern departments of Provence, making the grass greener and the soil more fertile. It is sometimes known as La Provence Verte... or Green Provence. Drôme Provençale - what's its story? The story behind the Drôme Provençale, or rather the history of the region, is fascinating. Its beauty and tranquillity today is matched by its turbulent and often tragic past, as much of the region was caught up in the destructive Wars of Religion (1562 - 1598). There are many historical buildings and villages to visit, all with their own stories waiting to be discovered. See, for example, the lovely Château Suze La Rousse, named after the lady of the castle who had flaming red hair... hence the name which means Suzy the Red! Then there is Richerenches, also known as the truffle capital of France, which has connections with the mysterious Knights Templar, and possibly links to the grail myths that are so popular today. Then there are fortified villages dating back to the Middle Ages and grand chateaux with connections to the French Revolution. Another important factor in the history of the Drôme Provençale was the silk industry, which brought much prosperity to the region at one time. There is a museum at Taulignan that tells the story of the trade in this region, and it is well worth a visit. Drôme Provençale - what is it known for now? The Drôme Provençale is famed for its wines (especially its rosés, which are the perfect drink for those balmy, southern summer evenings on the terrace), and certainly, there are many hectares of vineyards in the region (French properties with vineyards). In the south of the area you will also find the very Mediterranean sight of olive trees, and the markets of the Drôme Provençale are bursting with the produce of these trees, marinated in every possible combination of oils, herbs and spices and just begging to be bought and enjoyed. Lavender is also big here... and what a wonderful sight it is too, turning the entire countryside an amazing rich blue or purple in the summer time. In early summer there are huge golden sunflowers as well, making it truly one of the most beautiful and colourful parts of France. Drôme Provençale - who is it best for? Given all its advantages it's hard to imagine a person who would not fall in love with the Drôme Provençale. Perhaps there are people in this world who prefer grey skies and rain to blue skies and sunshine, or concrete and brick to mellow stone and lavender fields, but assuming that you are not one of them, you could almost certainly be very happy here. The region suits those who love glorious unspoiled countryside and ancient architecture, who appreciate good wines and long sunny days, and is great for those who enjoy everything to do with the great outdoors, for life in the Drôme Provençale is lived outdoors for much of the year. It's not as frenetic as the Riviera (French Riviera Property - an insider's guide), nor as sophisticated as the Alps (Alps property), but if these things aren't as important to you as quality of life, then the Drôme Provençale is the place to be. What types of properties or houses are for sale in Drôme Provençale? Unlike on the Riviera or in the swish resorts of the nearby Alps, it is still possible to find a small village house (House Renovations in France) or a good building plot (Land for Sale in France, Building or extending property in France) in a picturesque setting in the Drôme Provençale for under 100,000 Euros, or a larger property for between 200,000 and 300,000 Euros (at the time of writing). Much of the property in Provence and the Rhône-Alpes is priced beyond the reach of many people's pockets, but in the Drôme Provençale there is a more realistic approach top property pricing. It is also true to say that there are more of the cheaper properties available here (Cheap French Property), with plenty of pretty little village houses and small country farms to be found as opposed to the expensive chalets of the Alps (Ski Chalets for Sale in France) or the villas and mansions of the Riviera. The Drôme Provençale offers all that is best about Provence without the prices, and remains less hectic in the holiday seasons too. What's more, it's close enough to the Alps to appeal to keen skiers (Ski property)! The Drôme Provençale is becoming more popular as more and more property seekers discover its charms, but at the moment it represents real value for money and an idyllic lifestyle in a region that is still one of France's better kept secrets.